Project obstacles and solutions: In 2015, over-the-road trucking company, Venture Logistics, and The Indiana Railroad Company announced a joint venture to build a rail-to-truck warehouse in Indianapolis. The project included a new rail spur that runs into the building, 58 truck loading docks, and 400,000 square feet of warehouse space. Duke Construction served as the general contractor and Custom Concrete did all of the concrete work on the project. 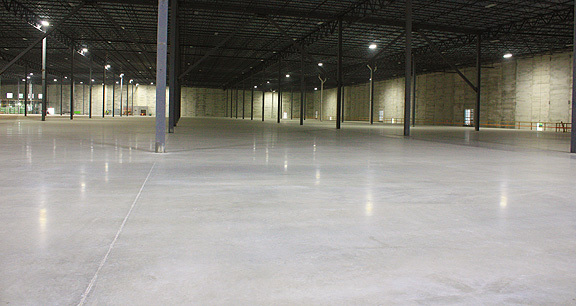 The floor of this warehouse was poured with imix XS steel fibers mixed into the concrete. Steel fiber is used to replace traditional reinforcement materials to control plastic shrinkage and thermal cracking in concrete slabs. The IRC (ESR-3226) recognizes imix XS steel fibers as a concrete admixture to minimize shrinkage and temperature cracking of normal weight-bearing slabs on grade. In this case, a high density of steel fibers was used to extend the control joints to the column lines. IMI QC/QA did extensive testing and design work with the structural engineer to come up with a dosage that would control shrinkage so the joints could be extended in this manner. The imix XS steel fibers also provided reinforcement and impact resistance from the weight of heavy moving equipment in the facility. Since the reinforcing steel was mixed integrally with the concrete, rebar in the floor was not needed. This provided a savings of time that would normally be used to place and tie off the rebar, set chairs, plus material and labor costs. IMI supplied 10,000 yards of imix XS steel fiber reinforced concrete for the warehouse. The new warehouse opened for business in August 2016. For more information on pouring concrete slabs with imix XS steel fibers, click here. For more information on pouring warehouse floors with minimal joints, contact the sales representative for the plant nearest your location. Click here.